All was calm aboard the UAS Maverick as the ship dropped out of warp space in the Eleinad system in Sector 35. It had been a couple of days since the ship’s crew raided Maelstrom’s base and they were now on their way to the planet Insipia to drop Persephone off. Upon Dane Lory’s death, the rest of the Maelstrom members on the station had surrendered and they were then turned over to Federation authorities. With her business in Sector 34 concluded, it was time for Persephone to return home. For Axel, the Maverick’s arrival in this system brought with it feelings of uncertainty. The mercenary wasn’t ready to say goodbye to Persephone just yet. Over the past several days since meeting the enigmatic woman, Axel had fallen for her grace, beauty, charm, and, of course, her skill with fire type Pokemon. He had never met anyone quite like her before and he doubted he ever would again. “What’s on your mind?” Persephone asked, joining Axel at the viewport he was staring out. “Just thinking,” Axel replied, pulling his eyes away from the vacuum of space to look at the subject of his desire. “I would be very annoyed with you if we didn’t,” Persephone said rather bluntly, folding her arms. “Oh, would you now?” Axel asked. He raised an eyebrow as a slight smirk crept onto his face. “Lucky me,” Axel said, his smirk breaking into a full-on grin, eliciting a laugh from Persephone. “That’d be the volcano you’re smelling,” Persephone said, pointing to the towering mountain in which dominated the view from the landing platform. “Ah, that would do it,” Axel replied, gazing up at the wispy trail of ash rising from its summit. Axel questioned the logic of building a settlement on the slope of an active volcano, but according to Persephone, the port town of Greywall had stood since the first settlers arrived on Insipia some two-hundred years ago. “So, what’s there to do around here?” Gaster asked stepping off the ship behind the pair. “There’s always the good old fashioned Pokemon hunt,” Taraka said, joining the group. “I have some business that I need to take care of,” Persephone said. “I will see you later.” Axel felt her beautiful red hair brush against his skin as she leaned in and planted a kiss on his cheek. Before the mercenary had a chance to process what had happened, Persephone had disappeared into the bustling spaceport crowd. “This must be the place,” Axel said to himself as he stopped outside the ornate red-roofed building he could only assume was the Sector 35 Pokemon Gym. After a few hours spent browsing the Greywall market, Axel had purchased a few TMs for his Pokemon and now he was waiting on his crewmates; they had split up to do their own shopping and had agreed to meet up outside the gym. “Let’s hope so,” Axel said. Before the pair’s discussion could continue, Gaster and Taraka arrived. “About time you showed up!” Axel called out to them. “That would be nice,” Taraka chimed in. “So, you boys ready to challenge the gym?” Kasey asked. “Ready as we’ll ever be,” Gaster said. Axel nodded. “Let’s do it.” With that, the mercenary took a stride forward. With his crewmates behind him, Axel approached the gym and stepped through the door. A short staircase led down into a large open arena, flanked on each side by three large stone columns carved with decorative geometric patterns. The arena itself was rather simple in design, simply a rectangular, stone-floored room. At the far side, three steps led up to a raised platform covered in a fancy red carpet upon which stood a familiar face. “Welcome to my gym,” Persephone said, a sly smirk on her face. Suddenly, everything made sense to Axel. “Of course you’re the leader of the Fire Gym,” the mercenary said, approaching the platform. “Oh, I’m ready to burn alright!” Axel responded, reaching for the Pokeball containing his Gyarados. “Let’s do this Saika!” The mercenary sent out his Pokemon, and his crewmates followed suit, sending out Tyranitar, Fraxure, and Togekiss. “Quick, Huntress, alpha strike with Dragon Claw!” Kasey issued the first command of the battle. Her Fraxure rushed forward and slashed at Persephone’s Pokemon with her razor-sharp claws, landing a decent hit. “Madea, Psyshock!” Persephone ordered her Delphox in response. Madea took a step back from her attacker, then let loose a powerful blast of psychic energy, doing a real number of Kasey’s Fraxure. “Sirius, use Ancient Power!” Taraka commanded his Togekiss. The monk’s Pokemon unleashed her attack, but the Delphox deflected it away with her powerful psychic abilities. Fortunately, Madea was distracted just long enough for Axel’s Gyarados and Gaster’s Tyranitar to move into flanking positions and catch her off guard. “So that’s how it’s gonna be, huh?” Kasey said as the Chandelure shrank down to become a smaller target. “Huntress, use Dragon Dance! Be ready to strike when it comes down!” Her Fraxure bared her claws and let out a fierce roar as she began to build up power. Kasey’s Pokemon may not have been able to get in range to attack while Willow was in the air, but that wasn’t an issue for Axel’s. “Saikia, use Dragon Pulse!” the mercenary commanded his Gyarados. Rearing her head up, Saika fired off a beam of draconic energy, landing a direct hit on the Chandelure. “Willow, use Inferno on that Togekiss!” Persephone ordered her Chandelure, prioritizing the flying Pokemon for the moment. The ghostly chandelier fired off a torrent of flames at Sirius, but the Togekiss was fortunately able to evade. “Inferno again!” Persephone quickly commanded in responses as the Togekiss lulled her Pokemon into a drowsy state. Luck was on Sirius’s side once more, and Willow’s attack missed. As the Chandelure then drifted off to sleep, Taraka recalled Sirius, then tossed out his Wailord directly beneath the ghostly Pokemon. “Rocklord, use Water Spout!” the monk commanded the massive water Pokemon. Like a powerful geiser, a column of water shot out from the Wailord’s blowhole, but miraculously it failed to hit the sleeping Chandelure floating above it. “How? !” Axel shouted in shock, causing a smirk to return to Persephone’s face. Returning his focus to the battle, Axel decided he’d take the time to set up while Persephone’s Pokemon slept. “Saika, Sunny Day!” the mercenary ordered his Gyarados. “Hrodulf, Rock Slide!” Gaster commanded his Tyranitar as Saika lit up the arena with an artificial sun. Not everyone was following Axel’s example, it seemed. The Tyranitar let loose a barrage of rocks at the Chandelure above, but luck was still on Willow’s side. The ghostly Pokemon continued to sleep peacefully, unaware of the stone projectiles hurdling past her on all sides, not a single one finding its mark. Angered by this, Hrodulf let out a howl of rage. “Good idea,” Axel said. “Keep setting up while we try to wake her up and lure her down. 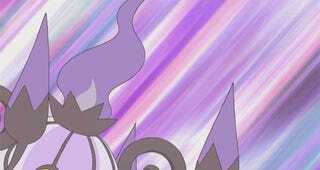 Saika, Lava Plume!” Rising up to her full height, Axel’s Gyarados positioned her head directly beneath the sleeping Chandelure, then erupted with flame, landing a decent hit on her opponent. Awakened by the attack, the Chandelure floated back from her assailant. “Willow, hit that Tyranitar with Hex while it’s enraged!” Persephone quickly ordered the Pokemon now that she was back in the fight. Floating closer to the ground to get in range, Willow unleashed a blast of ghostly energy at Gaster’s Pokemon, doing a real number on him. It wasn’t enough to bring Hrodulf down, however. “Fire back with Dark Pulse!” Gaster ordered in response. Hrodulf let loose a beam of dark energy from his mouth at the Chandelure, but the Tyranitar once more failed to land a hit. “Rocklord, Water Pulse!” Taraka commanded his own Pokemon, heeding the mercenary’s suggestion. The Gyarados and Wailord unleashed their attacks, both of them finding their mark. The combined assault seemed to leave Persephone’s Chandelure in rough shape, but Willow wasn’t going down just yet! “Get down there and use Heat Wave!” Persephone ordered her Pokemon. The Chandelure descended to the ground, right in the midst of all the challengers’ Pokemon, then unleashed a giant tide of flames at them. The devastating attack would have surely wiped the field under normal circumstances, but fortunately, all four Pokemon resisted fire, allowing them to hang in there. “Huntress, hit it with Dragon Claw!” Kasey commanded her Fraxure now that Persephone’s Chandelure was in range. With one swift strike, Huntress brought Willow down, but not before the Chandelure left her with a parting burn. 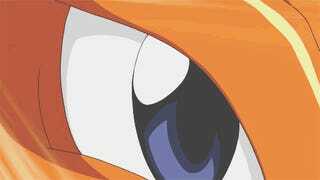 The gym leader tossed out her Blaziken next, causing Axel a moment of hesitation. He’d seen first hand how strong Persephone’s Blaziken was, even against Pokemon that resisted fire. The mercenary quickly shook the feeling off. He was here to win, after all. “Alright, Basan, High Jump Kick!” Persephone ordered her Blaziken, pointing at Hrodulf. Basan leapt at the the Tyranitar and struck him squarely in the chest with a powerful talon. Amazingly, Gaster’s Pokemon managed to stay up despite the injuries he’d sustained from the hit. “Rocklord, hit it with Ancient Power!” Taraka commanded his Pokemon. The Wailord fired off his attack, but Basan was too fast and jumped clear. The Blaziken may have avoided one attack, but Saika had maneuvered herself to cut off his escape. “Dragon Pulse!” Axel barked. His Gyarados fired off another beam of draconic energy, landing a decent hit on the Blaziken. “Hrodulf, use Thrash!” Gaster commanded his own Pokemon. The former smuggler’s Tyranitar lunged at Basan, landing a glancing blow as the Blaziken jumped away. “Huntress, Dragon Claw!” Kasey followed up with a command of her own. Despite the burns she had sustained, Kasey’s Fraxure moved swiftly and struck true, bringing Basan down. “Nice one,” Axel said, nodding at his crewmate. Taking advantage of the lull in the battle while Persephone selected her next Pokemon, Gaster recalled his Tyranitar and sent out his Milotic. Moments later, Persephone tossed out her next Pokeball, releasing a Houndoom, a Pokemon of hers Axel had yet to see. “Cerberus, you’re up,” Persephone said. “Hit that Wailord with Inferno!” Keeping distance, the Houndoom let loose a blast of fire and brimstone at Rocklord, burning and poisoning the durable Pokemon. “Rocklord, Rockslide!” Taraka commanded his Pokemon in response. Firing off a barrage of rocks, the Wailord managed to hit Persephone’s Houndoom with a few. “Saika, use Thunder!” Axel followed up with a command of his own. His Gyarados unleashed a bolt of electricity at Cerberus, but the attack didn’t seem to do too much. “Cerberus, take out that Gyarados!” Persephone ordered her Houndoom. “Dark Pulse!” Firing a beam of dark energy from his mouth, Cerberus landed a direct hit on Saika, taking her down. “Now, Thunder Fang on the Wailord!” Moving from one target to the next, the Houndoom sank his fangs into Rocklord and sent volts of electricity coursing directly into the Wailord. “Rocklord, use Water Pulse!” Taraka shouted to his Pokemon. The Wailord was just barely hanging in there, but he still had some fight left in him. He fired off a burst of water at the Houndoom, and landed a good hit. “Your turn, Tsumugi!” Axel shouted as he released his ice Ninetails. “Dazzling Gleam!” As she emerged from her ball, Tsumugi let loose a burst of brilliant light, enveloping the battlefield. When his vision cleared, Axel saw Persephone’s Houndoom lying on the floor, defeated. “Francisca, use Aqua Ring,” Gaster commanded his Milotic as Persephone recalled her fainted Houndoom. 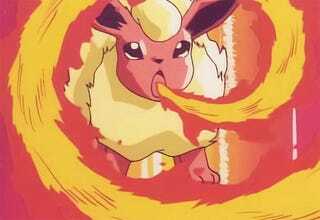 As the serpent surrounded herself in a watery shroud, Persephone released her next Pokemon: a Flareon. “Huntress, Dragon Claw again!” Kasey immediately commanded her Fraxure. The deadly dragon rushed Persephone’s freshly sent out Pokemon, but the Flareon quickly darted away. Huntress continued on running forward before collapsing, succumbing to her burns. “Pyre, Lava Plum!” Persephone commanded her Flareon directing the Pokemon after Rocklord and Tsumugi. Despite his cute and fluffy appearance, this Flareon quickly proved to to be powerful opponent. Running up between the Ninetails and the Wailord, Pyre brought both down with a radiant burst of flames. “Damn, that thing is strong,” Axel said he recalled his fainted Pokemon along with his two crewmates. The mercenary sent out his Alakazam next, while Kasey and Taraka went with Tyrunt and Aerodactyl, respectively. “Baroness, use Ancient Power!” Kasey commanded. 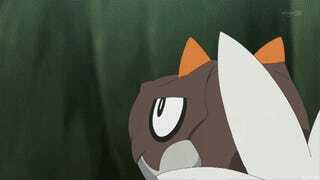 “You too, Fels!” Taraka shouted to his own Pokemon. Pyre dove out of the way as the Tyrunt’s attack came his way, but the Flareon was then struck by the follow up strike from the Aerodactyl. “Ryner, Psychic!” Axel then commanded his Alakazam. 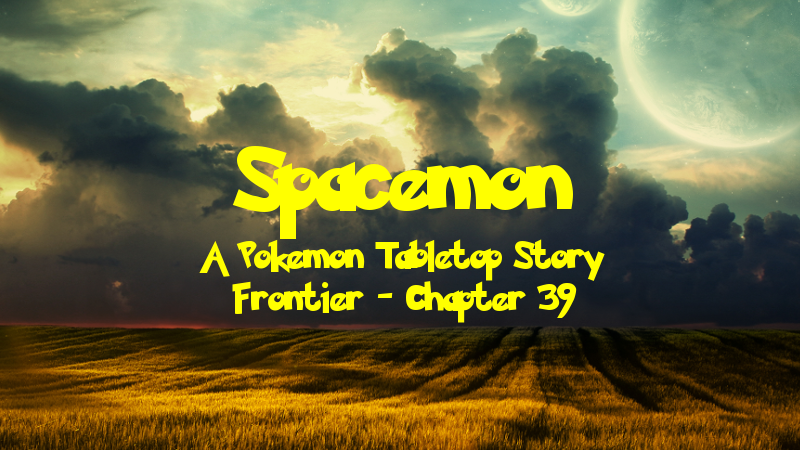 Ryner let loose a blast of psychic energy at Persephone’s Flareon, knocking him to the floor. “Francisca, Hydro Pump!” Gaster ordered his Molitc, seizing upon the opportunity. The serpentine Pokemon spewed out a highly pressurized jet of water from her mouth, striking the Flareon as he picked himself back up and taking him down for the count. Just like that, Persephone was down to her last Pokemon. “You’ve done well so far,” she said as she recalled her Flareon. “Now you must face one final challenge.” Tossing out her final Pokeball, Persephone released her Flygon onto the field. As she emerged from her ball, the arena erupted into sunlight once more, the artificial sun Saika created having long since burnt out. Before Persephone’s Flygon could take to the skies, both Kasey and Taraka ordered their Pokemon to attack. Both Pokemon hit their mark, but the Flygon didn’t seem particularly bothered. “Myrmecoleon, Overheat!” Persephone ordered her Flygon in response. Axel could feel the heat of the flames even from across the arena as the Pyraxian dragon erupted in a brilliant fiery explosion that engulfed all of the challenging Pokemon. When the flames cleared, both Ryner and Baroness had been dropped. Axel was impressed; Persephone had only captured Myrmecoleon a few days ago she already had turned the Flygon’s raw potential into a force to be reckoned with. “Francisca, Water Pulse!” Gaster commanded his Milotic in retribution. Unfortunately, Persephone’s Flygon lifted off, propelling herself into the air and over the incoming jet of water. “After it, Fels! Wing Attack!” Taraka instructed his Aerodactyl. Taking to the skies in pursuit of the Flygon, Fels Vogel struck her with one of his powerful wings, dealing a heavy blow. “Time to finish this,” Axel said, recalling his fainted Pokemon. “Ritsu, you’re up!” The mercenary’s Charizard let out a mighty roar as she emerged from her ball, then lifted off with a flap of her wings. “Fire Blast!” Ritsu spit out a huge ball of fire at Myrmecoleon, which exploded in a massive blast of flames. The Flygon then fell to the ground, defeated. “You’re not so bad yourself, Persephone,” Axel said, eliciting that sly smirk he’d grown use to seeing from her. “As a reward for such a magnificent battle, I present you with the Star Badge.” Persephone continued. She reached into her pocket and procured four Outer Rim Gym League badges in the shape of a seven-pointed star that glittered red as the light hit them. “Pretty,” Kasey said as she claimed her badge. “As a symbol of the Gym League ought to be,” Persephone said. “And of course, you shall all receive your prize money as well,” she continued, looking over at everyone else. “Money sounds good,” Gaster said. Notes: Oh boy, this was a bit of a challenge to write, mostly because I put off working on it and made myself finish it in the span of 2 days. This was session 31 of this campaign, and the first time this particular lineup of players all showed up. We actually took a week off after the last session because Alec and I went to see Metallica on the first North American leg of their WorldWired tour (that’s totally going to date this session and chapter and how far apart they were). Unfortunately, the week off made me forget my routine a bit and I forgot to start the recording at the beginning of the session. Luckily, I realized my mistake before the fight started, but some RP was lost. We all recapped what happened for the recording, but I still had to write some parts from scratch at the beginning of the chapter. I’m very happy with how it turned out, though. Novi actually missed the beginning of the session, so I ran his character for the first round of the gym fight, but he was here by the time his second turn came around. Speaking of the gym, Persephone was a gym leader all along! She wasn’t in the campaign she was my character in, but it made sense for this setting. If you hadn’t figured out this fun little twist, I’m sure things will start making sense now. I ended up making several mistakes in the gym fight, making it far easier than planned. I made sure to make it seem more challenging in the writing for the dramatic tension and continued with rearranging and altering details of the combat encounter to tell a better story like I did last chapter. I love how it turned out! Hopefully you do too.